Ross grew up in the small town of Puxico, in Southeast Missouri. He graduated from Southeast Missouri State University with a Bachelor of Science degree in Criminal Justice and a Bachelor of Arts degree in Spanish. In 2004, Ross served his country in Iraq with the United States Marine Corps as a rifleman in an infantry platoon. Upon his return from Iraq, Ross earned a law degree from the University of Missouri. Ross enjoys Mizzou sports, and all things outdoors. Ross is an active member of the Crossing Church in Columbia, and serves as the president of the board of directors for the nonprofit organization Welcome Home, Inc., which provides transitional housing for homeless military veterans. Ross is a member of the Missouri Bar Association, the Boone County Bar Association and the Missouri Bar Workers’ Compensation Law Committee. Ross is admitted to practice in all Missouri Courts, as well as the United States District Court in both the Eastern and Western Districts of Missouri. 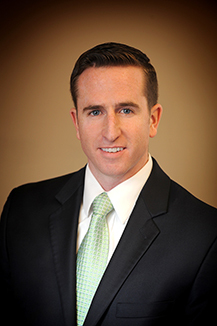 Ross has extensive experience in Workers’ Compensation Law, and regularly attends docket settings all over the state of Missouri. He has been before a majority of the current Missouri Administrative Law Judges, and has handled a number of appeals before the Missouri Labor and Industrial Relations Commission as well as the Missouri Appellate Courts.